This was auctioned in 2001. Based on the auction description, it could be assumed that the B-side features a recording. The most logical song would be "Don't Let Me Down". The auction description indicates that this is "...revised mix performed by Jerry Boys, second engineer for EMI..." This is not corroborated by either John Barrett or Mark Lewisohn. Barrett lists a mix not listed by Lewisohn (see 20 May 1969 in the Recording History below) but his entry lacks any details. Lewisohn notes Boys as 2nd engineer on only one mixing session for this song (7 April 1969). The only mixes done at that session produced both the standard stereo (RS1) and mono (RM5) mixes. This session also produced the standard RS1 and RM1 mixes of "Don't Let Me Down". Lewisohn also states that acetates were cut from those mixes and relates a story about Boys having a small portable record player at the studio that day which played the acetates and, thus, became the first record player to play the "Get Back" single. That info provides a minor but unsubstantiated connection to this disc. Could this possible be RM4 mixed 26 March 1969? Lewisohn states that acetates were cut but makes no reference to Jerry Boys. It appears that a different type of 'blank' disc was used for this acetate that featured a larger-then-usual generic label. The Beatles "Get Back" test pressing . 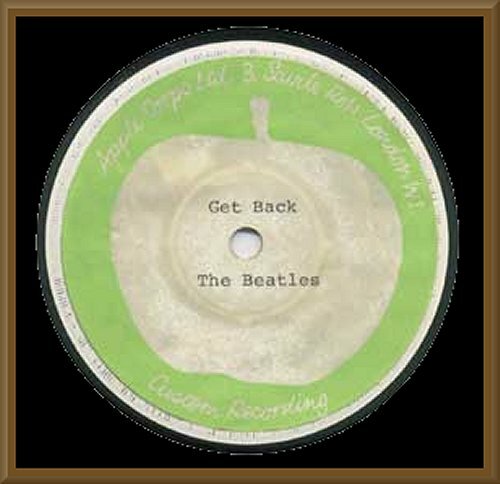 An original test pressing of the Beatles" "Get Back" 45 RPM on Apple in superlative condition. This piece comes from the Derek Taylor estate and is the revised mix performed by Jerry Boys, second engineer for EMI records. Both labels are fully intact, an accomplishment as these are notorious for losing their adhesive quality, and each display crisp color and distinct print. Both sides on this vinyl disc have splendid gloss with but a few light hairlines. Another important piece of Beatles history.